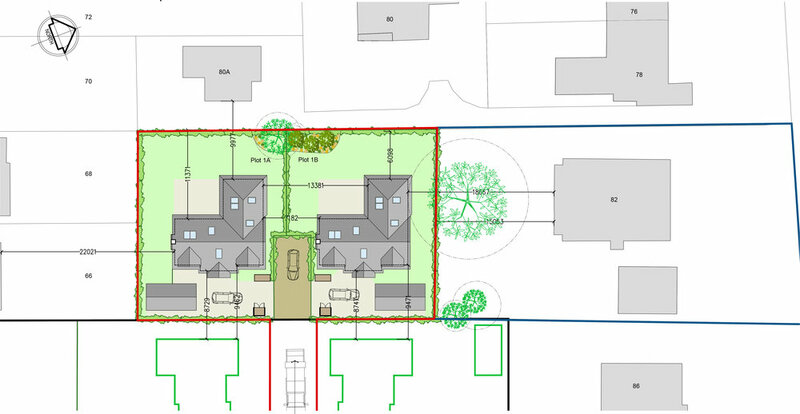 We have recently obtained planning permission for 9 dwellings in Salisbury. Formerly used as a plant nursery, the proposal at Britford Lane in Salisbury transforms the site from a tired commercial complex into a premium residential development. Comprising of 9 dwellings, two housing types have been designed incorporating a high quality design language unifying the site. A mixture of natural timber cladding and sharp brick work adds a modern edge to the traditional style housing. Strong brick gables relate to the local vernacular and bring a continuity to the proposal. The creation of four, three bedroom, semi-detached dwellings along Milton Road and one chalet dwelling bridges the gap in the street scene formed by the nursery and reinforces the street edge, enhancing the appearance of the area. Accessed from Britford Lane four, four bedroom, detached dwellings surround a central shared space, forming an attractive naturally surveilled public area. The house design for each dwelling incorporates double height spaces, large sliding doors and rooflights, helping to maximise natural daylight and create a variety of spaces ideal for modern family living. This is an exciting project for the office and we are looking forward to continuing development to take the project closer towards starting on site!